My plans for a reindeer army are underway. 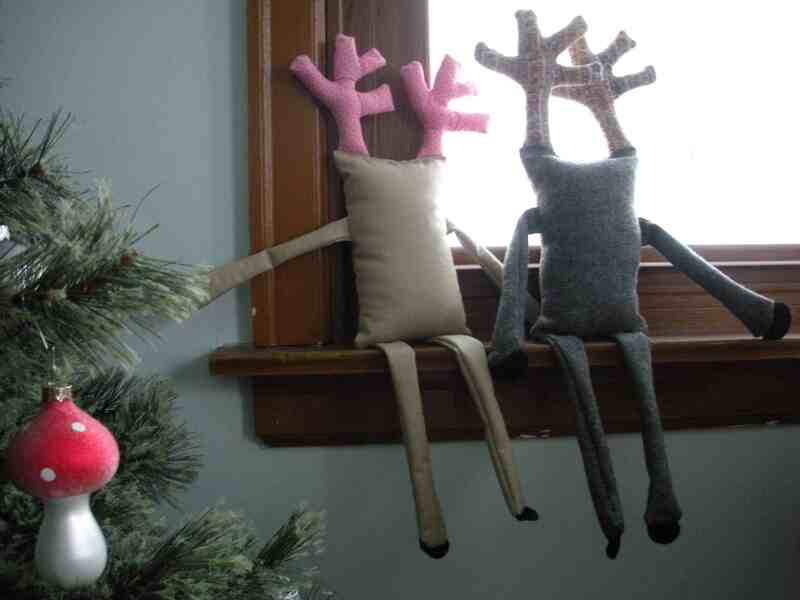 I’ve made two so far—the first one, on the left, took about five hours because I had to make the pattern, too, and messed up on the antlers the first time around (they were so small that I couldn’t turn them right-side-out). The second one only took about an hour. Stuffing the antlers is the hardest part. I wish I’d stuffed the first one a little more—I like how pleasantly tubby the gray one is. I also love the corduroy that I used for the antlers on that one—the next reindeer will have a body made out of the printed corduroy and solid antlers of some sort. The gray one is wool and the beige one is cotton—I have some other scraps of linen, corduroy, and wool that I’m going to try out to complete the army. I’m kind of wishing that I’d bought this piece of black and white checked wool that I saw at a thrift store this week—I might have to go back and get it. A plaid reindeer would be kind of amazing. I think I want to make at least five. Making nine seems like madness, but I could probably do it. i want to make some! these are awesome. who ate the reindeers’ faces? @ r: I could bring stuff to hyperbolic obsessive’s crafty thing…they take a while to make, but it’s not too hard. @ew: I know, I can’t decide what their faces should look like.